Banh Mi is one of the most flavorful sandwiches there is. It is a French-Vietnamese hybrid that draws its flavors from these two amazing cuisines. 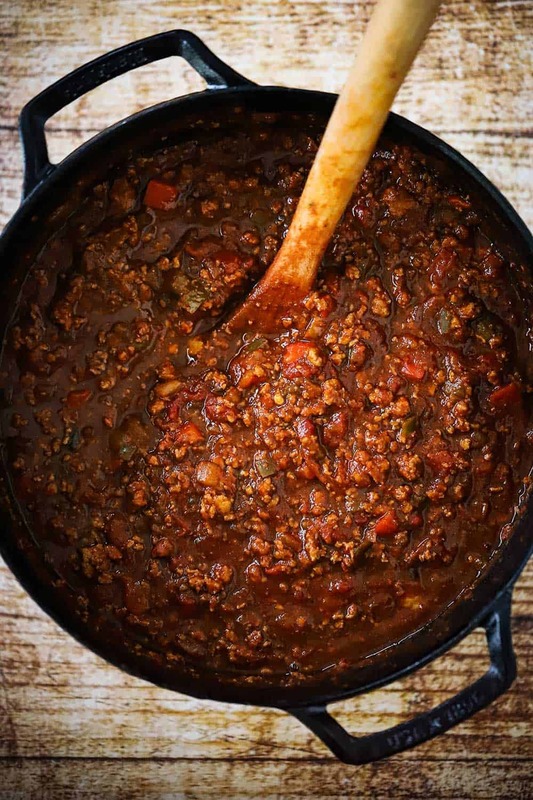 This recipe is authentic and can be served warm or at room temp. 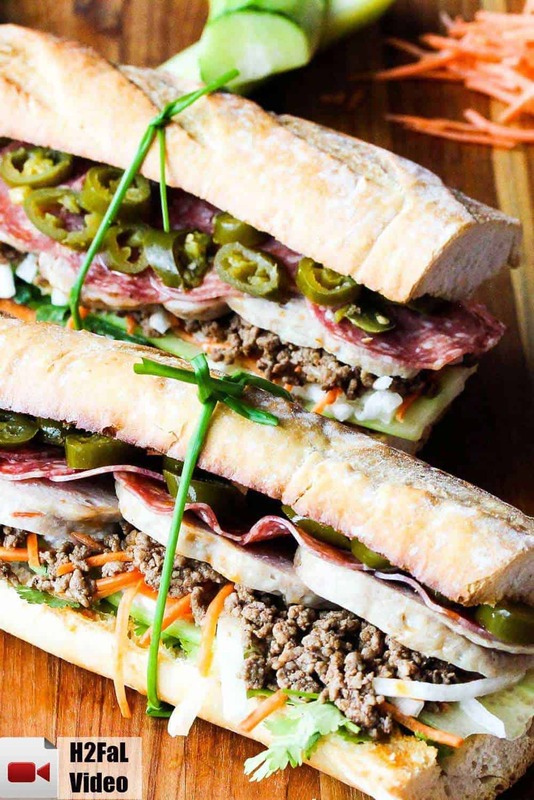 The history of the Banh Mi is fascinating and explains the French and Vietnamese influences that come together to make this incredible sandwich. Banh Mi has a little cool, a little heat, and a whole lot of texture and flavor. 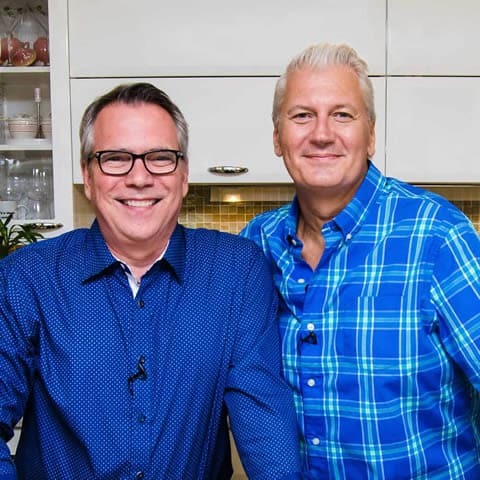 Watch us show you how to make this incredible sandwich, including one of the star ingredeints, a cha lua, or Vietnamese pork roll. 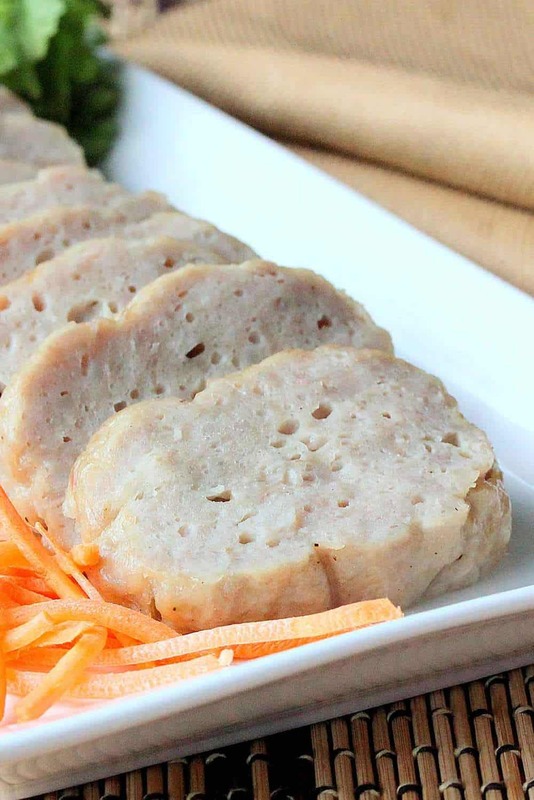 As mentioned, to make this truly classic, and truly wonderful in taste, you need to make the Cha Lua (Vietnamese Pork Roll). We love cha lua on it’s own, too. You can slice it then give it a quick fry in a skillet and eat it by itself. The Loon was surprised at how much he loved the cha lua after I gave him a slice and he reluctantly took his first bite. But that’s all it took was one bite. Then he was a cha lua believer! 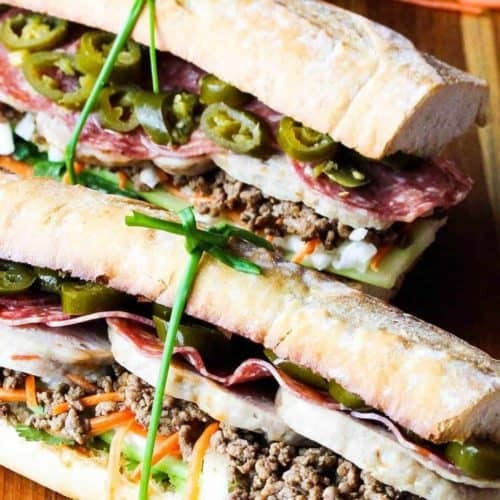 It starts with an airy baguette, lightly toasted, and is then loaded with cucumber, cilantro, cha lua (Vietnamese ham / pork roll), sweet and sour minced pork, salami, slaw of carrots and diakon radishes;, and pickled jalapenos. The daikon radish, Chinese five-spice powder and Asian chili oil can easily be found in your local Asian food market. If you can’t find them, you can substitute regular radishes for the daikon, cumin for the five-spice powder, and any kind of chili oil for the oil. Making an Authentic Banh Mi at home takes a little planning, most likely a trip to an Asian market, but that is so much fun. Start the cha lua the night before..and then bring it all together the next day. This Banh Mi sandwich is so loaded with flavor, it's unreal. 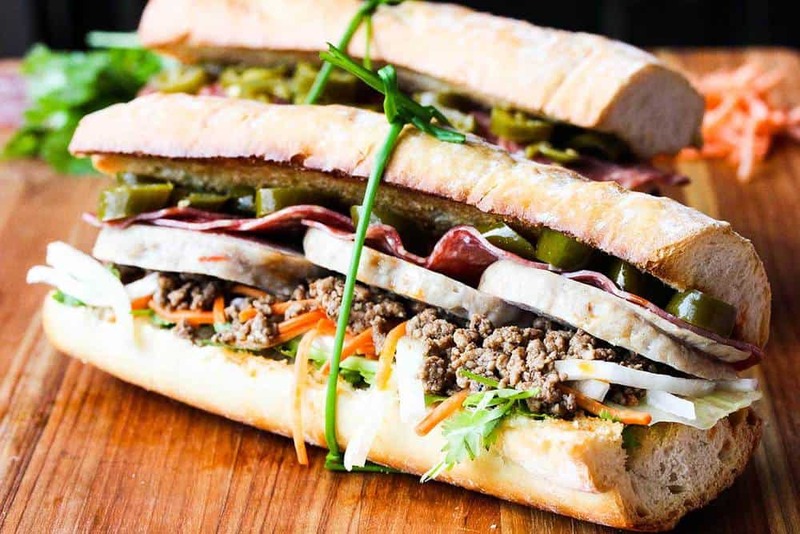 Drawing from French and Vietnamese influences, this is one of our favorite sammys. Make the Cha Lua ahead of time...it's fun, and so worth it! The flavors compliment each other perfectly here. Enjoy! Bring vinegar, sugar, and 1/2 cup water to a boil in a medium saucepan over high heat. Transfer to a medium bowl and stir in the carrots, radish, and salt (usually about 1/2 teaspoon). Set aside for 30 minutes, then drain. Add onion and saute until soft, about 3 minutes. Add pork, hoisin, soy sauce, sesame oil, hot sauce, five-spice powder, onion and garlic powders, and pepper. Cook, stirring often, until browned, about 5 - 6 minutes. Place the baguettes, cut side up, on a baking sheet, and place under the broiler for about 2 minutes until lightly browned and toasted. Keep an eye on them! Don't let them burn! 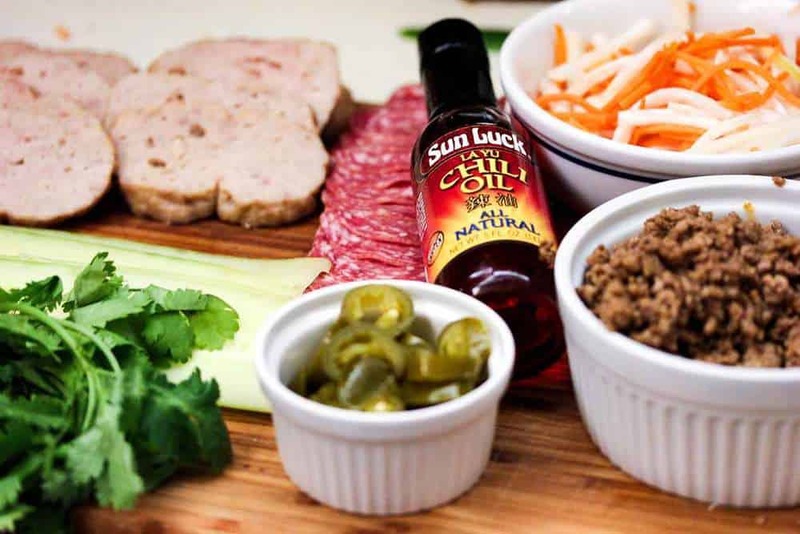 Cilantro, Cucumber, Slaw, Seasoned Pork, Cha Lua, Salami, Drizzle of Soy, Pickled Jalapenos, Drizzle of Chile Oil. Add the top portion of each baguette. Cut in half, if desired, and serve. OMG! I’m drooling over this incredible looking sandwich! Pinning.